If you are in the area of western NJ come join us for the 2 day Jamageddon music fest at the American Spirits Roadhouse in Asbury NJ. 14 top regional band over Friday and Saturday 3/29 &3/30. $10 per day or $15 for both, hosted by the Dana Gaynor Band. We go on each day at 9 PM. Plenty of parking, full bar, good food and great sound system make it a great time. If you can get there it's a definite party!! Just want to say a quick thank you for checking us out! I hope you enjoy our new single Ohio Mojo Funk. Quote from the album review Uncle Rock (rockfarbror.se). Rated 4/5. effect on me for sure. Here’s the fifth album in 10 years. and put some new colors on it. yet and definitely got a modern sound to the album. Lifelines contains stories from real life. freedom. She moved to Nashville where we met her. Alvén. A singer from Malmö with an amazing voice. innocent. No kid is born evil…Remember The Children. right… It’s a crazy world. and I will send you a link for free download. Enjoy and hope You’ll like! 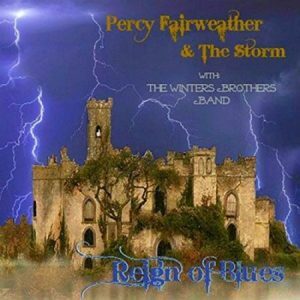 As band names go, Percy Fairweather & The Storm with The Winters Brothers Band doesn’t exactly trip off the tongue. To add to the intrigue, the musicians’ names are pseudonyms, the band comprising various old musical friends from different bands together with some family members. Lead singer and rhythm guitarist Percy Fairweather is actually Dennis Winters, who founded and led the Winters Brothers Band with his brother Donnie in the 1970s. The Storm is also known as crack guitarist/producer/engineer/songwriter/multi-instrumentalist Jamie LaRitz. Both players forged their reputations in the world of Southern Rock and they have played with everyone from the Allman Brothers to ZZ Top. The new moniker has a distinctly British sound to it. So, with hints of Doug Sahm’s Sir Douglas Quintet in the band’s name, how well do these Southern Rockers play the blues? Rather well, it transpires. Reign Of Blues was recorded in Ritz’s studio in Nashville and opens with the roaring slow blues of “Baby Hates To Love Me” with muscular-but-melodic lead guitar from LaRitz perfectly complementing Winters’ heartfelt vocals. A second slow blues, “When You Love Somebody”, quickly follows before we start to move into rockier territory with “One More Time”. The stop-time chorus and singalong chorus of “Go With The Flow” recalls late-era Blackfoot when Ken Hensley joined on keyboards. LaRitz’s playing is again quite outstanding. Winters’ daughter, Casey Winters, takes over lead vocals on the funky “Lesson Learned”. The core band however comprises Winters on vocals and guitars; LaRitz on vocals, guitars, bass, drums and keys; Chad Booher on drums and percussion, Cody Winters, Carly Winters, Jason Pitts and “Trez” on background vocals; Dave Murphy on keys and backing vocals; Matthew Randall on sax; Charles J Reagan on trumpet; and Joel “Taz” DiGregorio and Phil Wolfe on B3. Rick Brothers and TJ Wilder take the drum stool for one song each. Winters and LaRitz co-wrote all the songs except for the Dennis Winters/Austin Winters composition, “One Fine Day”. One of the emotional highlights of the album, “One Fine Day” features Winters singing a heartbreaking gospel melody solo and a capella. Clocking in at just over three minutes, there isn’t a wasted second on the song. (There is a live recording of “One Fine Day”, equally as good, added as an uncredited bonus track at the end of the album). The musicians are quite comfortable stretching out on songs. “Baby Hates To Love Me” is over seven minutes long. “Don’t Get Me Started is only a few seconds shorter. And the minor blues title track is a few seconds shy of nine minutes in length. It reflects the quality of both the songs and the musicians that no track outstays its welcome. Reign Of Blues isn’t really a blues album. “Don’t Get Me Started”, for example, recalls Robbie Williams’ “Let Me Entertain You”. “Heroes In Heaven” has a 1970s classic rock vibe. It’s a blues-rock album, and it’s one that will greatly appeal to fans of Gary Moore and Walter Trout. The songs are well-written and well-played, with some stellar guitar playing from LaRitz. And while it may not be a blues album, Reign of Blues is a very impressive, very enjoyable album.